It seems a bit intimidating, but it's not all that complicated. First there is a type definition for a function pointer which declares the prototype for a command function that takes a vector of strings as a parameter. It is this vector which holds any arguments being passed from the command line. Using a function pointer means a command can be told to point to any suitable function on the fly, enabling quick rebinding of commands to functions. The DataType enumeration is used by the command to store what kind of data the command is pointed at. The Command struct contains a union of two pointer types - one a function pointer, the other of type void which can be pointed at any variable. Storing the data type as a separate member means that the void pointer can be cast to the correct type when necessary, by first checking the data type value. The two pointers are stored in a union which means they share the same memory space. A command will only ever point to one or the other type and, as both members are pointers (not the data that they are pointing at), will only ever require the same amount of memory. While this works, and is efficient, it is also error prone. For example a command may be pointed at something else during its lifetime - but if the type member isn't correctly updated then trying to read the data pointed at can cause an error. If a command is pointed at a float variable but the type member is left stating that the data is of unsigned char, the data format will be both misinterpreted and only partially read (one byte of uchar for a four byte float). A compiler may or may not catch this error, but it will cause all kinds of undefined behaviour. The template declares a function prototype similar to that of the function pointer in the previous example - with the exception of the std::string return value (I'll come back to that later). 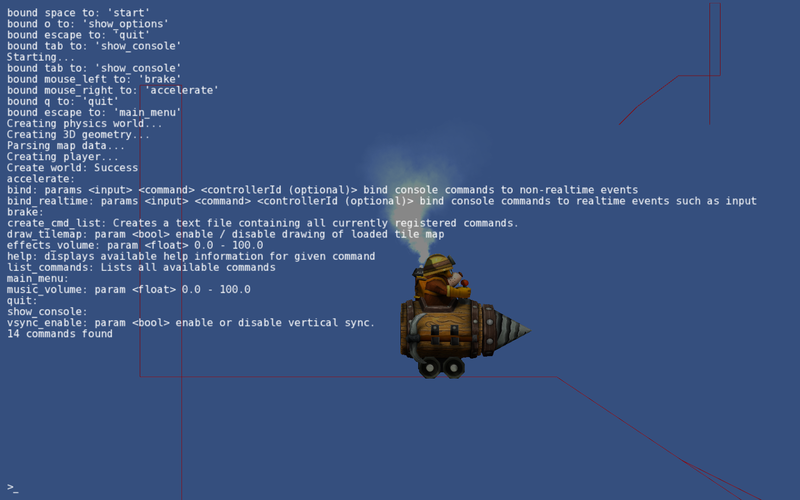 Now creating a command is safer and easier, and can be done anywhere in code which is accessible to the console class. This is a little generalised of course, a proper function would include code for validating argument values etc. Note how the lambda is able to capture the local variable myVar by reference and update it. There is a possibility, however, that myVar will go out of scope before the command is called, so you must be wary of its lifetime. Parse inputted command strings and forward them to the correct commands. The second two points on the list are a bit more involved. So far what has been covered is fairly generic and will work with any framework you may be using, but the graphical side of the interface is very much dependent on which library you use to draw on screen. In my case I'm using SFML, so from here I'll probably be covering a lot of SFML specific stuff. Actually parsing the command string is fairly generic and portable but, in my example, is tied to the SFML code. First I should note that m_show is a boolean set depending on whether or not the console is visible on screen. It's used in several places; here to prevent text being entered when the console is not visible. If an event is of type sf::Event::TextEntered it is then hooked, checked and appended to m_inputBuffer. The range check between 31 and 127 makes sure that the text is in the ASCII range of characters, and that Delete and Backspace strokes are ignored. The ASCII range it not so important - for other locales you may want to update this, but for my purposes it was enough to keep it simple. Once the character has been added to the line m_UpdateText() is called so that the changes are visible on screen. If the event is of type sf::Event::KeyPressed then any Backspace strokes are used to remove the last character from the input buffer (after checking that it has any characters to remove) then the display updated once again. It simply pushes the supplied string onto the output buffer and removes the front entry if the size exceeds a predefined limit. Then, if the console is visible, the sf::Text instances are updated with the new text. Returning to m_ParseCommand, if the command is not found an error is printed to the console. Finally the input buffer is cleared, and the on screen text is updated. which simply prints a list of all available commands to the console when you type list_commands. If you made it this far down the page, well done (and thanks!) this post has turned out to be a tad longer than I anticipated - hopefully a fact mitigated by providing at least some useful information. I had planned originally to go into the key binding system where the console class keeps a list of key bindings which can be used to execute commands at a single stroke but I shall have to save that for a post of its own, which will, with any luck, appear in the near future.